We had the opportunity to take in the Samsung Press Conference. Samsung announced several new products as well as several new joint ventures with other companies to enhance their products even more. Obviously there were a few new display related announcements including new TV designs as well as new innovations in the computer display market as well. Pres. John W. Park made some of the major announcements and demonstrated a VSB High Definition video camera and TV that allows you to wireless stream video content in real time to a TV. It looks like 2008 will be an interesting year in the Samsung camp. One of the key phrases mentioned by Pres. Park mentioned was "Life...made simple". 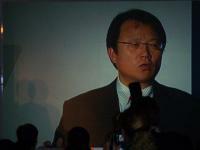 Samsung's goal is to make technology simple to use, simple to interact with and simple to get the information you want. Although there was a bit of a "not-so-simple" technical difficulty with Pres. Park getting the Wireless HD Camera and display to work, he also showed that new Samsung TV's are to come with an Ethernet port and support RSS. That means that you can get Syndicated News Feeds from BCCHardware and have them display real-time on your TV. You could also get other news stuff like CNN, NBC and more . . . if you don't want to have the BCCHardware ticker always on your screen. These series 7 TV's also come with a USB port and the ability to play many audio and video formats directly on the TV. These will be up-scaled for better quality. 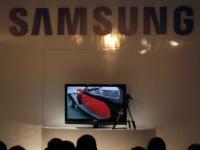 Samsung has redesigned their TV's and HTiB units with a "Touch of Color". These units will now come even more aesthetically pleasing and have a touch of color to show your personal taste and integrate into your life. This new design looks pretty sweet, but it doesn't give me a new purpose in life. Many of their new Home Theatre in a Box solutions will come sporting 5.1 sound, Bluetooth support and feature a first of its kind, 5.8GHz wireless sub. Samsung is also working on their digital camera segment and is working on HD digital cameras that integrate with their TVs. 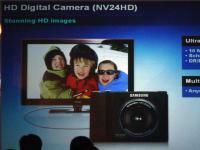 Select cameras will come supporting Anynet Plus that allows Samsung products to integrate seamlessly with each other. When applied to their cameras like the NV24HD, it will allow you to plug the camera directly into the TV and control your cameras features with your TV remote. Functions like slideshows and even simple editing will be able to be done simply with your TV remote. Samsung has a new LCD idea coming down the pipe that is actually a pair of screens in one nice tidy package. They didn't have actual hardware at the conference, but the LCD is the 2263DX and it comes as a 22" screen with an additional 7" screen. This screen can be positioned anywhere - right, left, top and even removed and placed on your desk. It is a USB connected display and we have no word on resolution or response time. The applications of this unit are pretty vast. It would be great in a bank, retail stores, or on the desk of an enthusiast who doesn't have room or budget for two large displays. 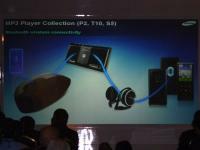 Lastly, they talked about their line of media players and portable devices. They have some very nifty and new devices coming down the pipe and are one of the few companies that have Bluetooth transmitting units that integrate well with bluetooth enabled cars, audio devices, and computers. Samsung is committed to value-adding their media players and releases firmware updates for bug-fixes and adding features to their line of media players. I'm a big fan of this idea and have been able to upgrade the firmware in one of my Samsung players while other companies have the ability, but don't seem to act on it. Samsung said that firmware updates would be a regular part of their devices as they are committed to their customers. Life...Made Simple. It's what Samsung says 2008 and beyond is all about and after viewing their Press Conference; I think they could be right.